Chris Cole/Allsport, via Getty Images. 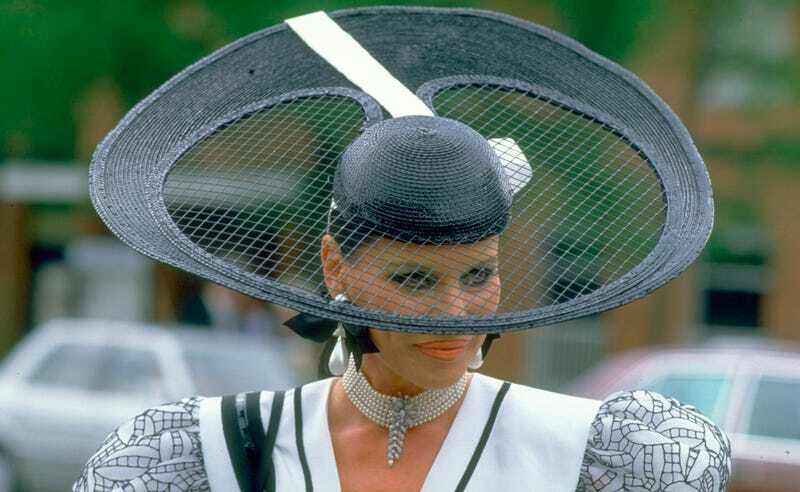 It’s the opening day of the Royal Ascot horse races in the UK, which reliably unleashes a flood of photos of fancy folks dressed to the nines. It’s been wire service fodder for decades, and news archives are full of glamorous photos going back to the 1920s or even before. But if you really want to see something special, you must to look to the looks of the late 1980s and early 1990s. First it was the era of Dynasty and Jilly Cooper and everybody was infatuated with enormous wealth; then the florals utterly hijack the proceedings. Consequently, the snapshots from Ladies Day in this particular stretch of time are astounding. Every other picture looks like an advertisement for Virginia Slims. You get to 1991 and suddenly the floppy hats appear, of course. Don’t mind me, just leaning on my Rolls. Simon Bruty/Allsport, via Getty Images. You think people have adopted completely ridiculous ensembles purely for the sake of social media? Wrong. Mike Hewitt/Allsport/Chris Cole, via Getty Images. Nothing said “luxury” in 1992 like a cell phone on your hat. It was a more innocent time, obviously.